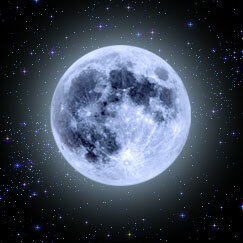 moon in lal kitab astrology - Moon governs over impregnation, conception, birth of a child and the animal instinct. She represents mother, mothers family, grandmother, old women, horse, navigation, agricultural land, Lord Shiva, love, kindness, mental peace, heart, services rendered for others welfare and the 4th house. The Moons effect comes up in the 16th, 51st and 86th year of the native and similarly its 1st cycle falls in the 24th year, the 2nd in the 49th year and the 3rd cycle falls in the 94th year of the native. The Jupiter, Sun and Mars are Moons friends, whereas Saturn, Rahu and Ketu are inimical to her. For her protection, the Moon sacrifies her friendly planets - Sun, Mars or Jupiter. Moon is the Lord of 4th house, stands exalted in the 2nd house of Taurus and becomes debilitated in the 8th house of Scorpio. The Moon provides very good results if placed in houses 1, 2, 3, 4, 5, 7 and 9 whereas the 6th, 8th, 10th, 11th and 12th houses are bad for the Moon. The death of a domestic milch animal or a horse, drying up of a persons well or pond, the loss of the senses of touching and feeling are the signs of moon turning malefic. The placement of the Ketu in the 4th house causes Matri Rina i.e. mothers debt. In such a situation pieces of silver of equal weight and size be collected from every member of the family and the same should be thrown together into the running water of a river. Consequently all the ill effects would be warded off.